The refreshing fruit punch is the taste of the English summer. Every June though, you hear the same question: we've got the Pimms and lemonade - but what to add? Fruit is the traditional answer - and lots of it. At some summer parties, the Pimms pitcher can look like an over-enthusiastic fruit salad. For a more elegant drink, it's better to stick to a theme. Orange is one of the prevailing notes of Pimms, so it makes sense to complement the drink with an orange slice. If you want the citrus kick but aren't so keen on the added sweetness, substitute lime or lemon, or even grapefruit. 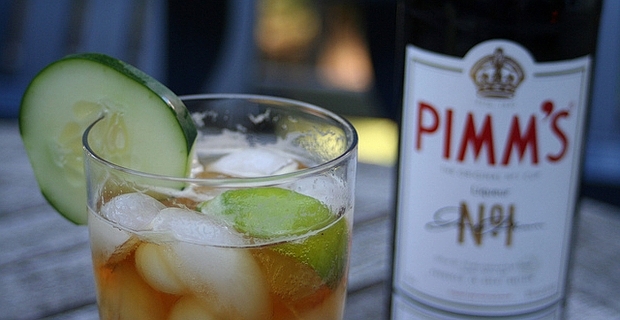 For those hot summer English days (both of them), Pimms becomes a cool and refreshing long drink with the judicious addition of mint and cucumber. This is the sort of drink you need at a picnic by a river, with a wide-brimmed summer hat and something mildly racy on the Kindle. For something more exotic, try Pimms with pomegranate juice, and a sprinkling of pomegranate seeds. This is Pimms on holiday in the Middle East, and it works well, adding a touch of dry astringency to the underlying sweetness. You can get away with strawberries during those two weeks of Wimbledon, but they don't add much to the drink, and can get soggy very quickly. Bananas and tropical fruit are probably best avoided. They are more at home in a rum and coconut cocktail and are a little too brash for this demure English rose of a drink.